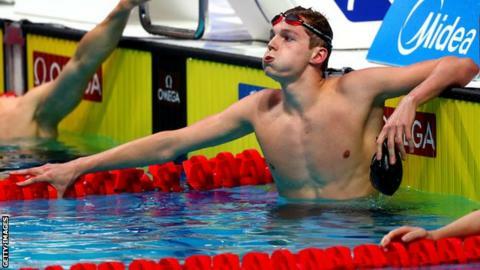 Double Olympic silver medallist Duncan Scott earned bronze in the Men's 200m freestyle at the European Short Course Championships in Copenhagen. Scott won two silver medals at the Rio Olympics in the men's 4x200m freestyle and 4x100m medley relays. Ross Murdoch, finished ninth in the men's 200m breaststroke heats. Murdoch finished four places ahead of Olympic gold medallist Adam Peaty, who swam a personal best of 2:07.34. Scott is competing in his first senior international short course event, as he prepares for next year's Commonwealth Games in Australia. A unique insight into Olympic champion Adam Peaty as he sets out to be the first swimmer to go under 57 seconds in the 100m breaststroke. How to get into swimming - find your local pool and get ready for a dip with one of Britain's most popular sports. Catch up with the latest diving news on our diving index.